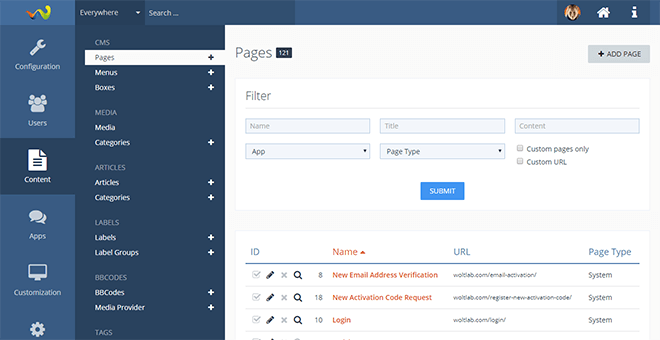 The foundation of our apps, backed by a fully featured CMS. Create and maintain own pages using a powerful and easy-to-use WYSIWYG editor, as simple as using a text editor. Pages can be backed by custom boxes that can be reused on any page and can contain anything from an announcement up to dynamically aggregated content created by your users. Use articles to catch up on important developments, report on your personal experiences, or organize a larger collection of valuable information. Enterprise-grade apps for WoltLab Suite. 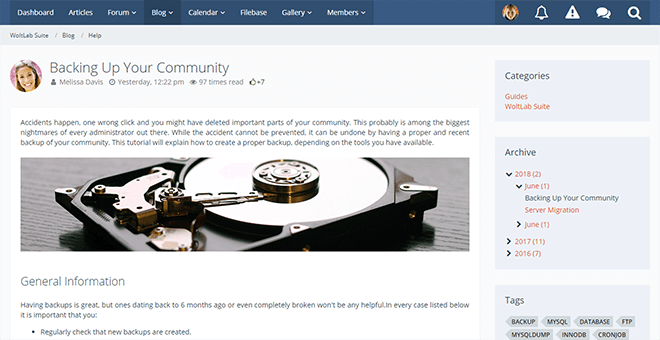 The award-winning forum solution for your community. Includes advanced features such as delayed publication, post merging, and duplication. Actions can be performed in bulk, ensuring maximum efficiency no matter what size your forum is. Subscribe to RSS feeds from external sites and have their content pulled over to your site. 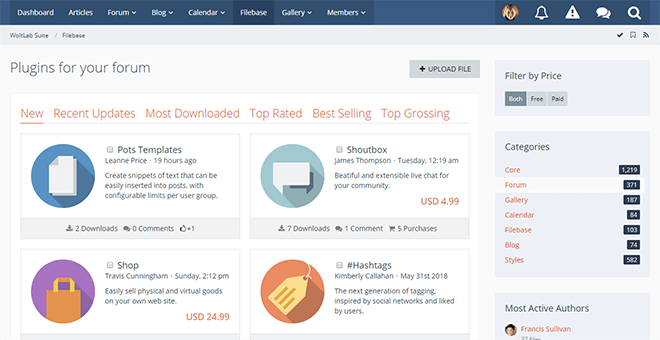 Assign tags and groups of labels to threads, helping users to quickly recognize the content. Keeping tracks of new replies and threads has never been easier, also by email. Acknowledging that images are more than just the composition of their parts. Create series of related images, backed by a dynamic slideshow and full permission control. Opt-in to apply a fully customizable watermark to all uploaded images. Tag users or place text notes to explain parts of the image in a non-obstructive fashion. Connect images with their location and view them on a map, supports coordinates from EXIF. Announce and organize upcoming events with participation management. Events can be configured to repeat themselves with a configurable delay between them. Users can indicate their participation including additional attendants. Opt-in to automatically create discussion threads in the forums. 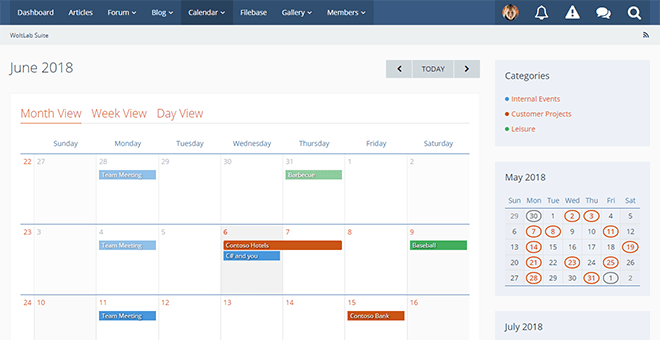 Events can be easily imported and exported to calendar apps such as Outlook or other mobile apps. Easily distribute files and documents with permissions and versioning support. Each file can hold multiple versions using distinct version numbers and remarks. Add arbitrary input fields to categorize files and provide custom information to match your requirements. File access can be restricted to certain users only. Optionally it is supported to sell files directly. Encourage your users to contribute their knowledge and share their experience. 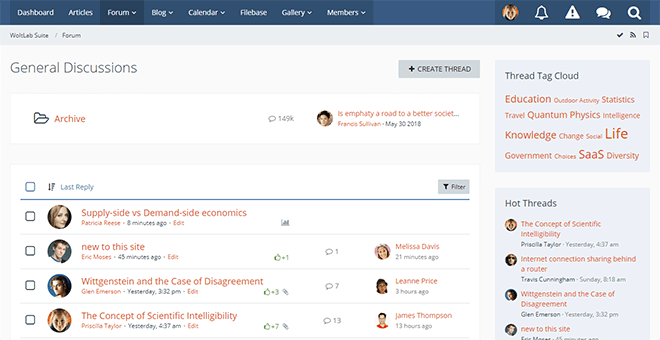 Allow users to split their work across multiple blogs, each dedicated to different topics. Each blog can have different access restrictions attached to them, accounting for any degree of privacy. Add additional authors to a blog, allowing them to contribute their own entries. 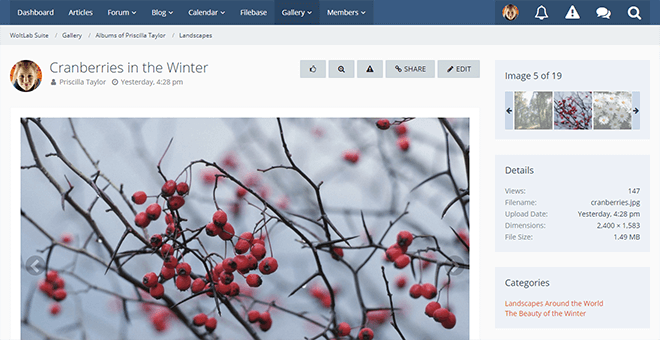 Assign blogs to categories to strengthen the relation between similar blogs and make use of tags to connect it with other content, such as forum threads, calendar events or gallery images. Highlight entries by marking them as featured, these entries will be shown at additional places.